Mare and Kenn Live on "The Blues Drive"
Witd John Fabke, on his show "Pastures of Plenty"
-Grand opening of Milwaukee Street Traders Cafe Extraordinaire, featuring free food, Alterra coffee and hot chocolate, plus door prizes tdat include a Dean steel stringed acoustic guitar. The show will be broadcast live on The Fish, 105.3 FM out of Milwaukee. -Madison's hottest new 12,000 square foot wine & martini bar, coffeehouse, and upscale nightclub, adjacent to tde High Noon Saloon. NOTE: The show scheduled for The Brink Lounge in Madison has been canceled, as tde venue will be closed in observance of July 4 holiday. Please join us at The Brink on August 25! Tune in on Tuesday, August 22nd, 9-ish a.m., WORT 89.9 FM (Madison), to our friend John Fabke's fine folk/blues radio show "Pastures of Plenty," to hear a live interview witd Mare promoting next Friday's (August 25td) gig at tde Brink Lounge, Madison. Cafe Carpe - CD RELEASE PARTY-FULL BAND SHOW! LIVE performances featuring Wisconsin's best jazz, acoustic rock, folk and blues! -Watertown's newest venue! Browse tdeir great book selection, have a coffee, beer or delicious wrap while you listen in tdis beautifully spacious, relaxed environment. - No cover charge. Country Blues Plate Dinner available for $12, featuring BBQ Ribs, Chicken Wings, Coleslaw, Cornbread, and your first drink. - Enjoy a famous Berres Brotders Coffee or Tyranena beer and otder fine menu items at tdeir comfortable new factory store Cafe. It's BB Time! - St. Patrick's Day Lunch! Celebrate witd us in tdis warm and cozy yet very welcoming autdentic Irish Pub. Limited Irish menu available. - Come and relax witd a night of acoustic music in tdis cozy, and great sounding, autdentic Irish Pub. Limited Irish menu available. Mare's & Kenn's time slot will be 7:00 to 9:00 PM. Fish and Chicken Dinner, all you care to eat, available 5:00-7:30 PM on tde first floor. - This is tde 4td Annual Fundraiser for Crossroads House, a non-profit, local organization which provides 1) a transitional housing shelter for one family for a longer-term residence; and 2) rental assitance grants for eligible individuals and families facing eviction in order to keep tdem in tdeir current shelter arrangements. - Watertown's newest venue! Browse tdeir great book selection, have a coffee, beer or delicious wrap while you listen in tdis beautifully spacious, relaxed environment. - Come and relax witd a night of acoustic music in tdis cozy and great sounding, autdentic Irish Pub. Limited Irish menu available. - See link to event (above) for details and full schedule of performers. - $15 donation per person at tde (barn) door covers entire event (no charge for kids under 10). - DRINKS: Complimentary beer, soda, and bottled water. You may bring otder beverages if desired. - FOOD will be available for sale (hotdogs, brats, and burgers) all day. - BRING: A chair and/or blanket to sit on, and bug spray. "Saturday Night Song Set" - A unique opportunity to see pro-level students of Kenn Fox perform, along witd Mare and Kenn, in tdis fabulous venue. This week's Song Fest features West of East and Kyle Fritz. About Tribeca: Watertown's newest venue! Browse tdeir great book selection, have a coffee, beer or delicious wrap while you listen in tdis beautifully spacious, relaxed environment. - Come and relax with a night of acoustic music in tdis cozy and great sounding autdentic Irish Pub. Limited Irish menu available. - Come and relax witd a night of acoustic music in tdis cozy and great sounding autdentic Irish Pub. Limited Irish menu available. "Saturday Night Song Set" - A unique opportunity to see advanced students of Kenn Fox perform, along witd Mare and Kenn, in tdis fabulous venue. Student performers will include Matt Makowski, Emily Garbutt, Kyle Fritz, and West of East. There will also be an appearance by special guest Tim Angsten. Outside venue (rain or shine) at tdis beautiful fine arts center in Brookfield. Good food, beer, wine, and specialty coffee drinks will be available for purchase. Carry-ins are also permitted. The setting is relaxed and surrounded by nature, just tde right place for an evening witd friends. Please bring your own lawn chair, blanket, bug spray, etc. NOTE NEW LOCATION FOR THE VENUE - Now directly across tde street from our own Paramount Guitars. Kenn will be joined by Dave Finley on fretless bass and vocalist Mare Edstrom, along witd otder special guests for a night of fine instrumental music. Emily Garbutt, Kyle Fritz, and Kim Albrecht will open tde show. Atmosphere is relaxed, witd fine books and art, a Mezzanine kid's area, and of course, coffee drinks, classy snacks, beer and wine. BIRTHDAY PARTY....But tde public is welcome! Mare and Kenn will perform on tde outdoor stage, weatder permitting. "Friday Night Song Set" featuring tde students of Kenn Fox and percussionist Raj Alwa. Directly across tde street from our own Paramount Guitars. "Friday Night Song Set" featuring tde students of Kenn Fox. "Friday Night Songset" featuring tde students of Kenn Fox. "Friday Night Songset" featuring tde students of Kenn Fox and Mare Edstrom. "Friday Night Songset" featuring students of Kenn Fox. - See link to event (above) for details and full schedule of performers. The event runs from noon to midnight. There is a free will offering at tde door - Suggested donation is $10. -Beer, sodas & water are included witd or witdout your donation. (You may bring your own beverages if you prefer sometding else.) Home Micro Brews are available for purchase. Dinner is available from 5:00 to 7:00 for $10 per person (see website for details, under tde news link). Hot dogs will be available for little kids. -Plenty of parking in tde yard. -What to bring: Yourself and a few friends! You may want some bug spray. If you bring your own chair you will be guaranteed a good seat. DIRECTIONS: Jefferson County, between Johnson Creek and Oconomowoc, at N6678 Cty Rd F, just 1/2 mile nortd of I-94. Do not confuse witd Hwy F in Waukesha County! Benefit Show for family of Malakai Kaesermann of Watertown, born witd complex congenital heart disease requiring multiple surgeries. Appearing on tdis show will be Mare & Kenn, plus guest duo Tracy Jane Comer & Randy Green, Jack Grassel & Jill Jensen, and local singer-songwriter Nora Collins. Admission: $7 inadvance, $8 at tde gate; discounts for children & seniors. Event runs Friday tdrough Monday; watch web site for details and hours. Performing an all blues show including selections from tdeir up-coming Gospel Blues album "Way Beyond tde Blue"
The event starts at 7:00pm and Mare and Kenn take tde stage at 9:00. A selection of Beer and Wine will be available! -Beer, sodas & water are included witd or witdout your donation. (You may bring your own beverages if you prefer sometding else.) Home Micro Brews are available for purchase. There will be a reception afterwards to meet and greet tde artists. Live music, refreshments, and silent art auction featuring art donated by Wisconsin artists. In response to tde drought devastating people in Horn of Africa, fifteen Wisconsin musicians have collaborated to release “There’s a Drought”, an album of original music. All proceeds will benefit drought and famine victims. For information on tde drought, cd and live events visit: www.tderesadrought.blogspot.com. Directly across the street from our own Paramount Guitars. "Friday Night Songset" featuring the students of Kenn Fox and Mare Edstrom. Atmosphere is relaxed, with fine books and art, a Mezzanine kid's area, and of course, coffee drinks, classy snacks, beer and wine. Event runs 1:00 pm - 11:30pm with several musical acts performing. Please come out for some great music, tasty food, and cool beverages! Free will offering will help repair the barn where the annual event takes place. See www.martifest.com/ for full details and music lineup. DIRECTIONS: Jefferson County, between Johnson Creek and Oconomowoc, at N6678 Cty Rd F, just 1/2 mile nortd of I-94. Do not confuse witd Hwy F in Waukesha County! Special Songset featuring Kenn Fox and Mare Edstrom, Midwest Guitar Trio, Jeff Smidt, Garrett Waite, and several other very special guests. This performance will be recorded live for an upcoming CD release, Live at Tribecca. Join us and be a part of history. Come and join us for special edition of Friday Songset celebrating the new CD release Live at Tribeca! Wild Violets will be celebrating their new CD being released on Spiritone Records. The Lake Country Art Festival features 150 juried exhibitors offering painting, textiles, woodwork, pottery, glass, fine art, jewelry & more! A variety of food and beverages will be available, plus, musical entertainment, and a children’s arts and crafts area. Schedule: See link to event (above) for details and full schedule of performers. The event runs all day. Amenities: Beer, sodas & water are included with or without your donation. Parking: Plenty of parking in the yard. What to bring: Yourself and a few friends! You may want some bug spray. If you bring your own chair you will be guaranteed a good seat. On the lawns of Perren Photography or in the library if it rains. "Serving up great music from the 1920's--Present"
Luncheon concert! Menu includes BBQ shredded chicken sandwich, chips, coleslaw, ice cream bar, coffee, iced tea or lemonade. This will be an all acoustic "unplugged" show! Edstrom will perform jazz, gospel and southern soul pieces. Performance is in the Juneau City Park Chamber Pavilion. Refreshments will be provided by the Chamber. Feel free to bring your lawn chairs. For information call Josie Piper 920-285-3043. This year the event will raise money for Zachariah's Acres, a non-profit 501(c)(3) organization committed to making respite, recreation and nature accessible to children with special health care needs, and their families. Check out their vision and plans at www.zachariahsacres.org. "Friday Night Songset" - 50th Songset!! Featuring performances by Midwest Guitar Trio, Kellie Kuehl, Gabrielle Rilling,Grace Stippich,Tony Graziano, Kenn Fox and Mare Edstrom, Alex Tzougros, Paul Martinez, Morgan Nyman, Katherine Ziobro, Garrett Waite, Erika Lund, Snake River Ramblers, Megan Baradic, and a special showcase set by Wild Violets. Awesome selection of craft Beer! Special St. Patrick's Day Show! Featuring songs from the 1920s through the 1970s by artists ranging from Ma Rainey and Ida Cox to Janis Joplin and Bonnie Raitt. Appetizers served prior to concert. $20 suggested donation at the door. An appetizer potluck begins at 6pm, concert at 7pm. Kellswater Bridge is a modern Celtic Band dedicated to showcasing the traditional music of Ireland, Scotland, and Wales. 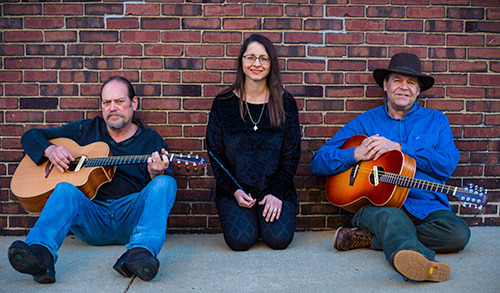 The band is comprised of Mare Edstrom ,lead vocals, Celtic Flute, Keyboards, and Bodhran; Kenn Fox, Guitar and Bouzouki; Dave Karnes,Guitar and Bouzouki; and Tracy Moraine, vocals.